PRO-LOK AKUL Ultra Long Reach Kit (AKUL) FREE SHIPPING! 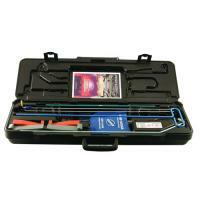 The Ultra Long Reach Car Opening Kit by Pro-Lok (model no. AKUL) features quick-change bodies and accessories that, when used together, allow entry into pretty much any locked vehicle. Simply select the best tool body for the situation and screw it into the 1/4 inch diameter handle. The included 18 inch extension piece can be added between the tool and the handle to create a 67 inch-long tool. Once assembled, the entire tool comes together with a smooth, seamless profile, avoiding the use of bulky couplers that can get stuck or unnecessarily scratch surfaces. Each body also has a glow-in-the-dark tip to help in poorly lit or nighttime conditions. All of the components fit into a convenient carry case for easy, organized storing and portability. The kit contains a total of thirteen items: a thin-diameter hook body, a thin "L" body, a rigid handle, a rigid 1/4 inch diameter body, an 18 inch extender, a protective tool sleeve, two plastic wedges, a pump wedge, two mini rubber wedges, an instruction book and a plastic storage-carrying case. Case Dimensions (L x W x H): 28" x 9" x 4.5"
©2002-2019 CopsPlus.com: PRO-LOK AKUL Ultra Long Reach Kit (AKUL) FREE SHIPPING!